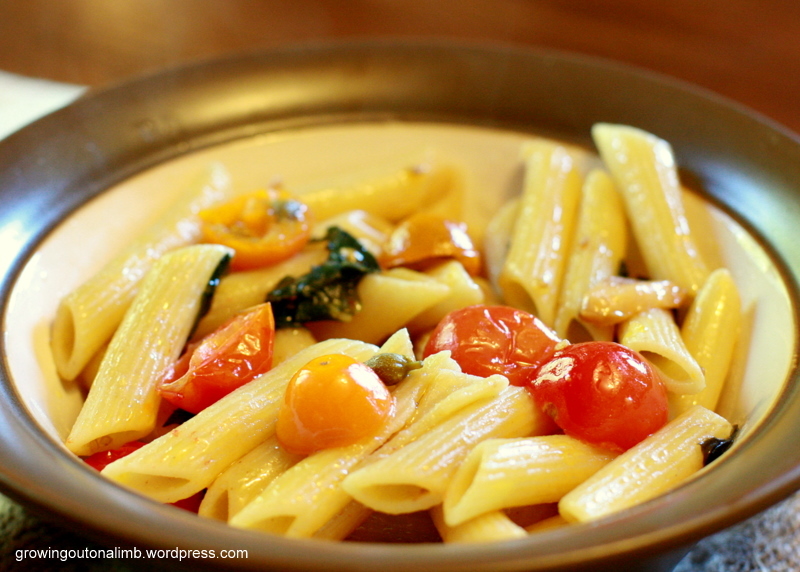 This is a fresh, summery pasta dish with simple and classic flavors. I know it doesn’t look like much in the picture but I’m in love. I first saw the recipe in my Living magazine but it is also here online. 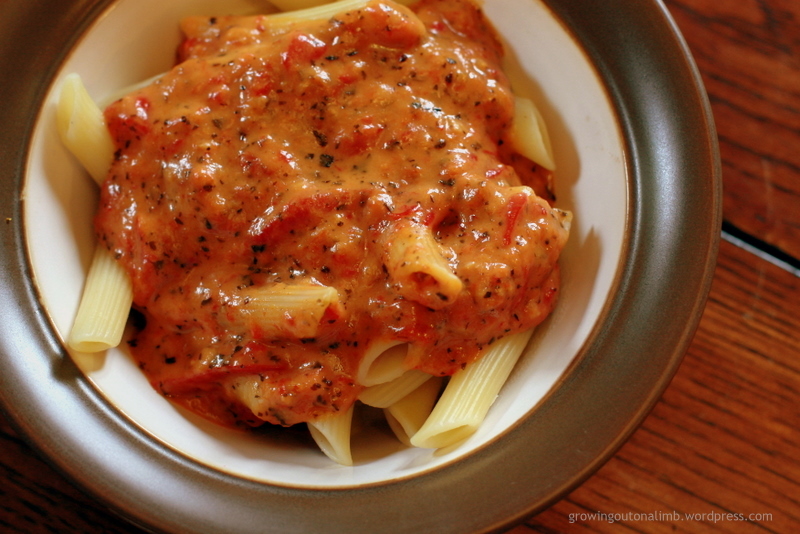 Martha’s recipe uses fancy flat pasta that I was not able to find (and don’t want to afford online) so penne works just fine for us. Sometimes I substitute dried basil for fresh, especially in pasta dishes, but you definitely need to go with fresh here. I don’t know if it’s the capers or the tomato-basil flavor combination but this one is a keeper. Heat garlic in oil in a saucepan over low heat until pale gold, about 10 minutes. Let cool. Combine tomatoes, 1/4 cup basil, capers, lemon zest, red pepper flakes, and 1/2 tsp salt in a large powl. Pour garlic oil and chips over tomato mixture. Marinate, covered, tossing occasionally, for 30 minutes. Add warm pasta to bowl and toss gently. Top with remaining 1/2 cup basil. Season with pepper. Sprinkle with lemon zest. Categories: Recipes: Pasta | Permalink. When the Superstore puts those bags of four red peppers on sale I always grab one with the intention of roasting the peppers for something. I rarely know what: hummus, soup, or maybe just on sandwiches. This time I did this pasta sauce. Oh yummy. I did make a few changes based on comments: I used milk instead of half-and-half, parmesan cheese instead of Romano, dried basil instead of fresh (although fresh would be preferred) and I left the butter out completely (it was good without it but I might add at least some next time). I also added a bit of flour to help thicken things up. Roast the red peppers. Cool and remove skins. Cut into small pieces. In a skillet, cook the garlic, basil, and red peppers in 3 Tbsp olive oil over medium heat for ten minutes. Puree using an immersion blender. Bring to a boil. Stir in the flour and cook for a minute or two. Add the half-and-half slowly, then the Parmesan cheese. Cook and stir until the cheese melts. (If using, add the butter and stir until melted). Season with salt and pepper to taste. Simmer for five minutes. Categories: Recipes: Dips & Sauces, Recipes: Pasta | Permalink. I’m not sure how I came across this recipe but I’ve made it several times since – it is quick and easy to do after work and, most importantly, Oliver-approved. I usually omit the chili flakes for fear of getting too many and ruining it for Oliver. And I’m experimenting a bit with it: last night I added carrots (julienned and cooked with the onions) and finely-chopped spinach (added with ginger – it really just needs to wilt a bit). Brian didn’t even notice! I think you could dress this up in a million different ways. Cook noodles or pasta in a large pot of boiling water. Drain. Meanwhile, m﻿Mix peanut butter, soy sauce, water, vinegar, sugar, and red pepper flakes. Combine oil and onions in a small skillet. Saute over low heat until tender. Add ginger; cook and stir for 1 to 2 minutes. Add the peanut butter/soy sauce mixture and mix. Remove from heat. Toss noodles with the sauce and serve. Sorry, no picture! Oliver We were too anxious to eat. 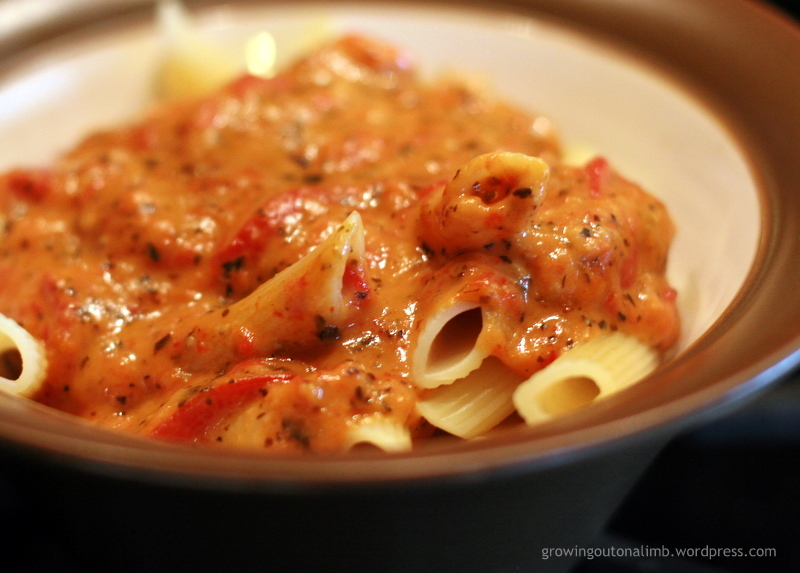 Categories: Recipes, Recipes: Oliver-approved, Recipes: Pasta | Permalink.